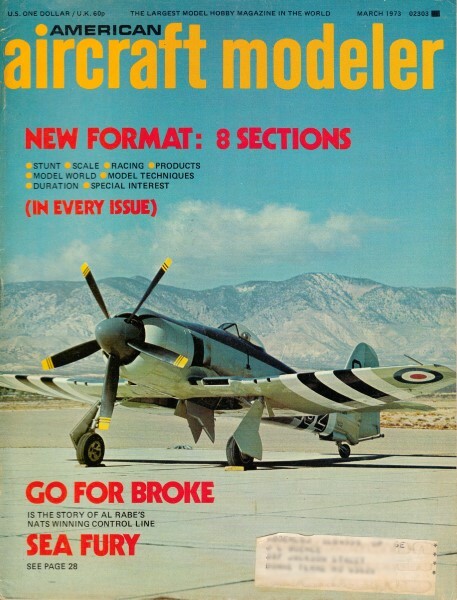 Oddly enough, this extremely long article on Al Rabe's famous Sea Fury control line scale stunt model does not include plans. I checked the AMA Plans Service website and do not see plans listed there, either, so unfortunately for anyone wanting to build this model, there won't be any help available from the AMA. The main purpose of this article seems to be the extensive research and empirical testing Al Rabe did with airfoils, planforms, control surfaces, etc., in arriving at his final winning design. He even performed live runs of test airfoil sections to determine lift and drag with and without flaps. I scanned this article at the request of an Airplanes and Rockets website visitor who hoped to get plans, but no can do. Dang. Most controversial stunt model is full of new construction techniques, up-to-date aerodynamics, engine/muffler ideas, and ample trimming capability. Little did I realize a year and a half ago as I sat studying the FAI rules that 1971 was going to be a "go for broke" year. At that moment I was feeling helpless frustration. It was an FAI qualification year and, according to the rules, mufflers would be required. I think most stunt fliers dread the thought, initially at least, of using mufflers as they add weight, rob power and cause cooling problems without improving, in any way, an airplane's ability to fly a pattern. I was particularly upset as my semi-scale Mustangs and Bearcats tended to build heavy. Also, for optimum performance, even the lightweight Bearcat III needed all of the power that an ST 46 could offer. Since my current airplanes could afford neither the weight nor power loss of a muffler, clearly, a new airplane was needed, designed to FAI rules. Because of the power loss, this new airplane would either have to be smaller to use the very fine ST 46, or about Bearcat size with a larger engine. In general, Bearcat size airplanes have a slight advantage over smaller airplanes because of slightly more favorable Reynolds number and usually a somewhat better visual impression. I therefore decided to build the Bearcat size airplane and use the lightest 60 available having the necessary conservative porting and reasonably long stroke. This narrowed the choice to the ST 60 at 12 ounces (with venturi, not carburetor). The extra weight of a heavier engine, larger tank, extra fuel, muffler and stronger nose structure dictated that my new stunt ship should have a short nose and could possibly profit from a longer than normal tail moment. After spending a few hours looking at Green's Famous Fighters of World War II, I found several airplanes which would make excellent semi-scale stunt ships by profiting heavily from the above-mentioned nose and tail moment changes. The Spitfire and Hawker Tempest V seemed the most ideal with the Tempest V having the edge because it offered the possibility of enclosing the muffler within a large "chin" radiator. When I drew up the Tempest V, the nose was so large that the ST 60 cylinder head didn't even extend into the "chin" radiator area. As a matter of fact, at that scale, the engine and muffler would go into the radial cowling of the more attractive Tempest II. From there I couldn't help but notice the Hawker Sea Fury which has the same wing and cowling as the Tempest II, better lines, and a colorful service paint scheme. To the disadvantage of the Hawker airplanes were their wings which have outboard dihedral breaks. After a couple of weeks of stewing over the immensity of the project I decided to "go for broke." Win or lose, I was going to build my muffled airplane and would somehow manage to make it more realistic than previous semi-scale designs. Figure 1 - Airfoil test rig. All runs late at night on straight, smooth stretch of back country roads. Figure 2 - To investigate UC Stunt airfoils, one must begin by understanding the best available "classic" airfoil - the·Nobler. Cores for 1/16 sheeted tail surfaces. All these assemblies, as shown, weigh .4 oz. The Sea Fury's shock absorbing gears and Rabe's method of lacing them to their mounts with .032 aircraft brass safety wire. Will never loosen at all. Method of assembling molded fuselages. Second half is still on mold. Most sanding done while on mold. 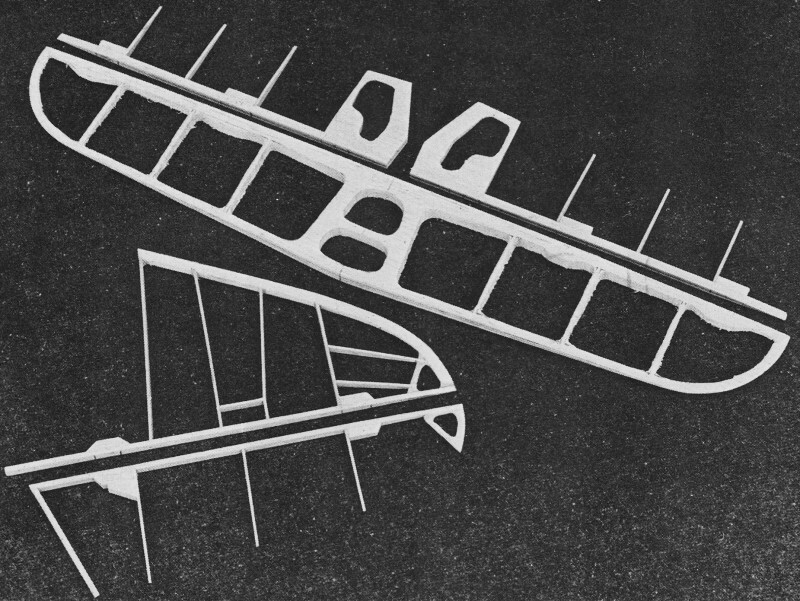 Four aft bulkheads laminated 1/32" ply 3/32 balsa. Note tailwheel mount installed. Figure 3 - A "simple" type flap. Harder to build, nearly impossible to properly hang and 10 to 15% less efficient than Nobler airfoil with sheet flap. 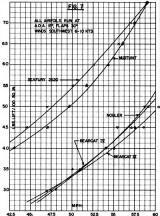 Airfoil, test sections actually used to prepare graphs. 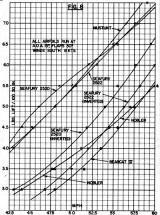 To find the reason for my "super" airfoil's poor performance, I researched about 30 years Of NACA Technical Reports and found that "simple" flap airfoils at Rn 3 x 106 produce a CL Max (maximum .coefficient of lift) of about 1.6 (call it a figure of merit). 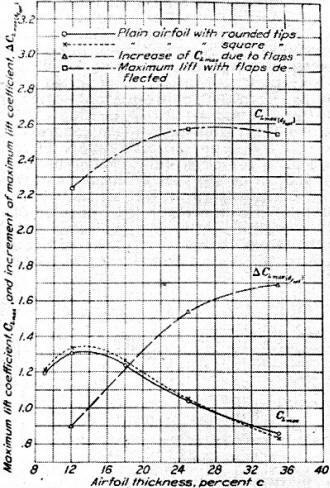 "Fowler" flaps can produce a CL Max of about 2.8 at Rn 3 x 106. Although a "Fowler" flap moves to the wing trailing edge while extending (which our stunt ships can't duplicate), the fully extended "Fowler" flap that produces this CL Max of 2.8 looks much the same as our stunt airfoils with a depressed flap hinged to the wing trailing edge. So, while our sheet flaps aren't retractable, they do appear to have the lift capabilities of the "Fowler" flap. At this point, I removed my T-28B ribs from the jig, put away the plans, and packed the rifle-barrel-like molds I had machined to form molded" balsa flap leading edges. The T-28B project was dead - that air­plane just wouldn't look right with a larger wing. 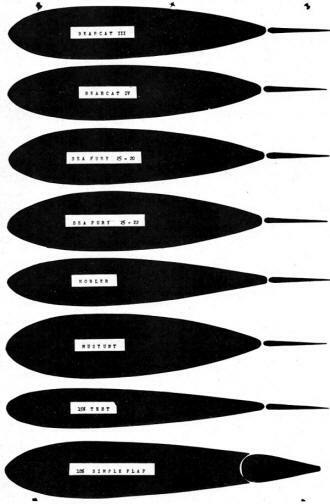 Smaller airfoil "B" with flaps develops 50% more lift than airfoil "A" without flaps. 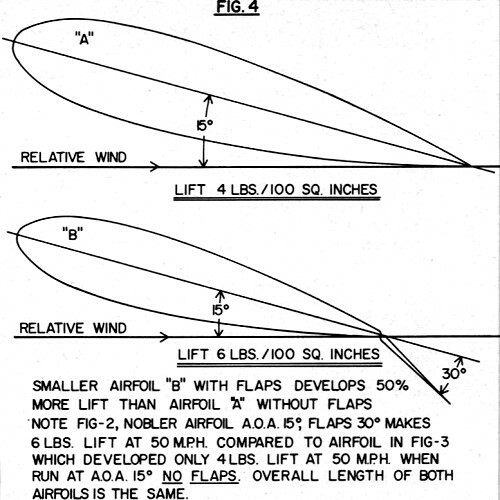 Note Fig-2, Nobler airfoil A.O.A 15°, flaps 30° makes 6 lbs. lift at 50 MPH compared to airfoil in Fig-3 which developed only 4 lbs. lift at 50 MPH when run at A.O.A. 15° NO FLAPS. Overall length of both airfoils is the same. Bearcat I modifications. It's never too late to cut into a good stunt ship to improve its performance. Bearcat I had 950 logged flights when this modification was made. Airfoils presented here are 25% of original size. Figure 6: Variation of maximum lift coefficient for an airfoil, with and without flaps, and increment of maximum lift coefficient due to flaps with airfoil thickness for three NACA airfoils. Reynolds number, 3,000,000; aspect ratio, 6. 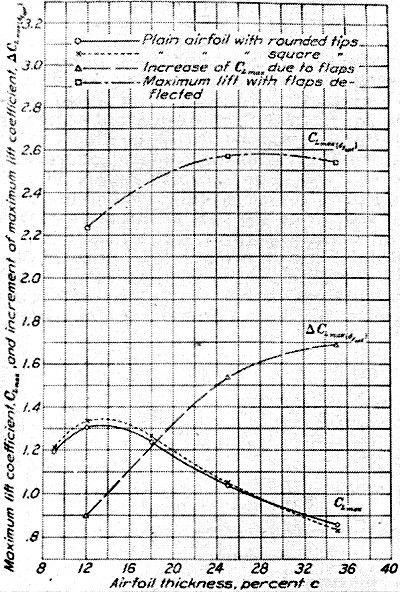 Figures 7 and 8 show improved lift attainable by increasing thickness of airfoil. Now I was ready to design the Sea Fury wing. I knew that to carry the Sea Fury's weight I was going to have to use large flaps and a 25% section. Take your choice, the wing would have to be either big or thick. Wait a minute! The AMA stunt pattern itself is asymmetrical requiring far more lift for the lower right triangle and hourglass corners than anywhere else in the pattern. Since these are both inside corners I should be able to get away with an asymmetrical airfoil with a 25% curvature on the top of the wing and a flatter 20 to 22% curvature on the bottom for the less demanding outside squares. 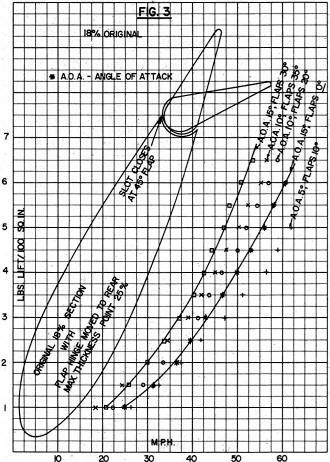 By tailoring the airfoil to the lift requirements of the pattern, I could have my high lift characteristics and still slightly reduce the bulk of the wing. Again, I decided to "go for broke" and use the completely untried asymmetric airfoil concept on my Sea Fury to improve the appearance of the wing. At this point I built two new asymmetric test sections and waited six weeks for a calm wind night to test them (I live in Texas, you know). Finally, in desperation, I ran the tests in an eight-knot wind - I just had to get started building the Sea Fury wing. To explain my asymmetrical airfoil designations, the Sea Fury 25-20 has a top of the airfoil similar to the top half of a 25% symmetrical section. The bottom half of the Sea Fury 25-20 is similar to the bottom half of a 20% symmetrical airfoil. 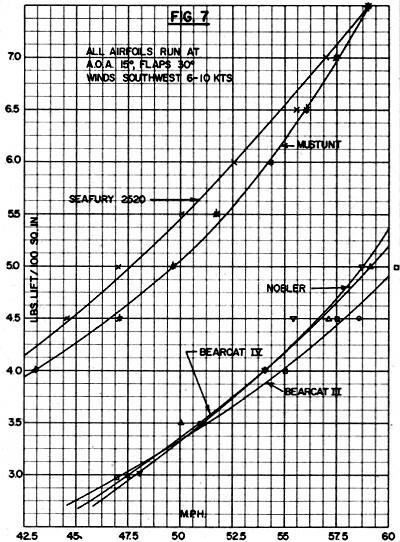 The Sea Fury 25-20 test section lifted better inverted than the inverted Sea Fury 25-22 which was contrary to what I expected but probably accounted for by the 25-20's blunter leading edge radius. (Fig. 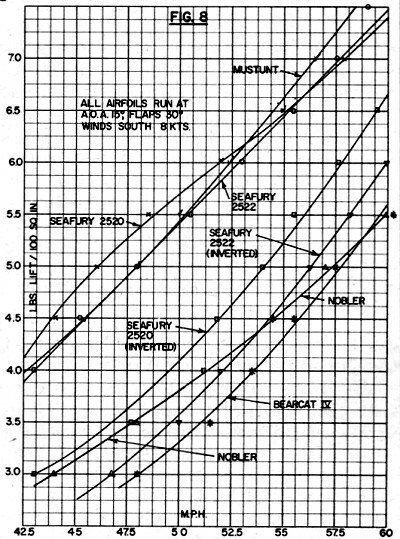 8) Had I conducted these tests in a calm wind, I would probably have used the 25-20 on my Sea Fury. As it happened, however, the airfoils with slightly sharper leading edges tended to run more smoothly, buffeting less in the wind, making it possible to gather sufficiently good plotting data with fewer automobile runs in each direction. This characteristic of smooth operation in the wind was, I thought, more important than the slight loss of lift inverted, so I selected the 25-22 and finally began to build my Sea Fury wing. I am through testing airfoils, for now, at least. I think the point of diminishing returns has been reached and look for little additional improvement in practical stunt wings. I say "practical" because: 25% is about as thick as a wing can be made and still look reasonably, attractive (though thicker wings would, no doubt, lift more); stunt flaps are near the limit of development; practical leading edge devices could be used but would hurt appearance; and the only remaining area of possible significant improvement is boundary layer control which, at present, looks too gimmicky and unreliable for heavy competition use. It seems now that optimum practical results will be obtained by a thick airfoil with moderate leading edge radius, large traps, and a profiled trailing edge. Every effort should be made to keep the point of maximum thickness as far forward as smooth transitioning of airfoil curvature will permit. While I used the asymmetrical 25-22 on both Sea Furys, I am not recommending asymmetrical airfoils for general use. They are a "special" solution to a "special" problem. Tests would seem to indicate that I am getting about half again more lift now, from these thick wings than would normally be obtained from conventional stunt wings of the same area. Over a thousand flights with my Sea Furys and almost 500 more on Mustunts seem to verify this approximation. Excepting the outboard dihedral breaks which subsequently caused little or no difficulty in either building or flying, the Sea Fury wing is an unusually fine choice for a semi-scale stunt ship. The clipped tip elliptical layout packs much more area into a given span than a straight taper, and provides for convenient mounting of adjustable leadouts. Also, the Sea Fury's unusually small wing tips themselves helped to avoid, almost completely, high lift wing tip yaw sensitivity which has made other big flap stunt ships more difficult to trim to contest smoothness. The Sea Fury also has adequate leading edge sweep for stability, scale dihedral perfect for proper vertical location of leadout exits and, of course, the visually effective elliptical platform which looks so good in the air. Since "going for broke" was the order of the day, I decided to use a shock absorbing landing gear to overcome the conventional gear airplane's tendency to bounce that cost me the 1970 Nats. They only add 1/2 oz. each and work well. As a result, the Sea Fury seldom bounces, even on a hard landing. Also, spectators seem to enjoy watching the Sea Fury "float" over a rough surface with the gear working to follow the contour. Fuselage after being bolted on. Alignment must be perfect by this stage. 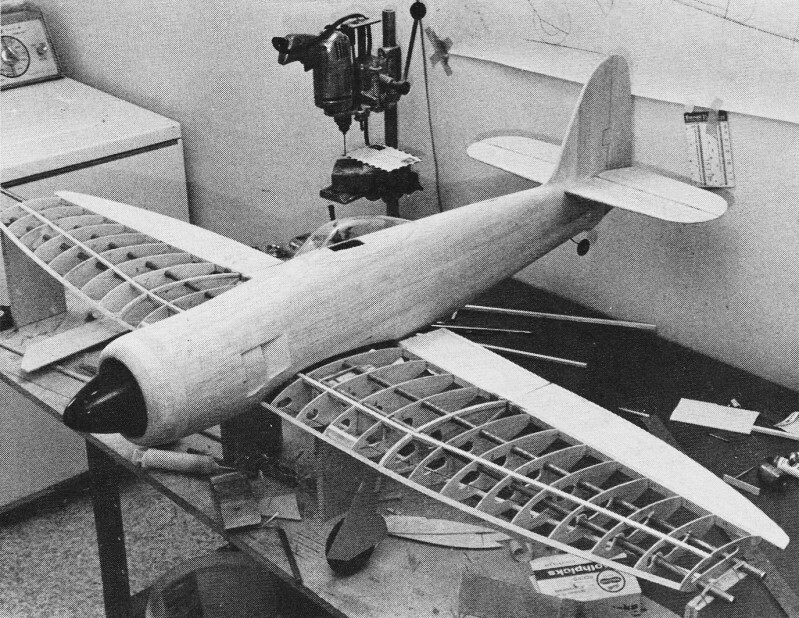 Note wing is jigged on rigid tubes, removed later. As I pointed out earlier, the. extra weight of the larger engine indicated the desirability of a short nose. 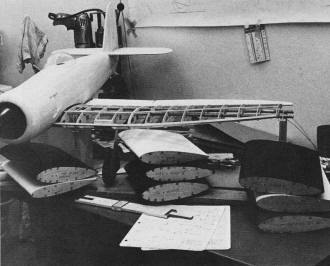 By molding the fuselage from balsa and using all built-up tail surfaces, a really long tail moment should be possible. The "go for broke" attitude prevailed again. 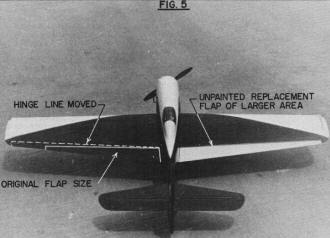 The fuselage was drawn exact scale except for relocating the wing leading edge one in aft. this still left me with the rather unusual seven-in. nose moment (wing leading edge to prop) and 20 1/2 in. tail moment (flap hinge to elevator hinge)! The spinner would be the 3 1/2 in. Williams P-51 and the cowling would be six in. across! Oh well, I figured I could use the space inside. This would be one airplane nobody mistook for a modified Nobler. 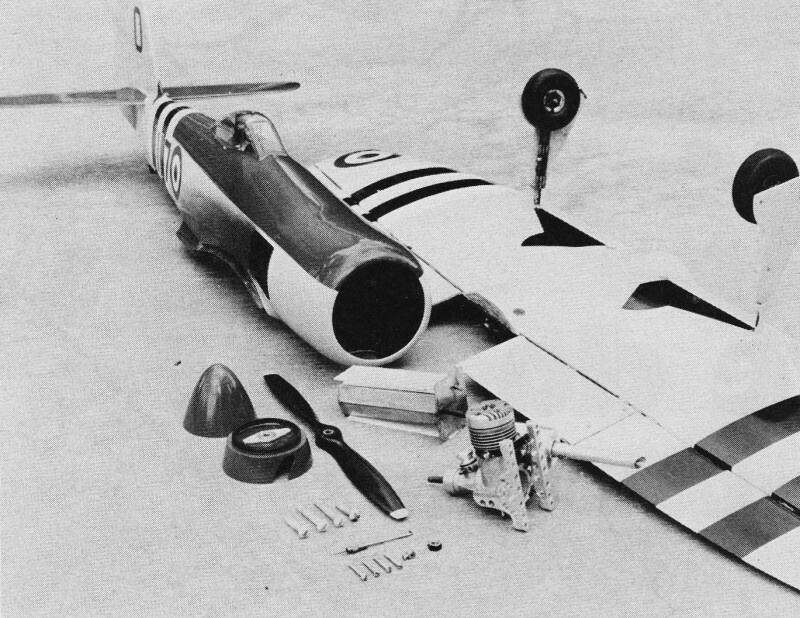 The front end of the Sea Fury fuselage quickly became so complicated in design that I had to build a forward fuselage mock-up to properly locate the firewall, engine mounts, 6.5 oz. adjustable fuel tank, cooling bypasses and the muffler installation. It soon became apparent that no commercial muffler would work without making the fuselage impossibly difficult to build; so I decided to design my own. It would have to be short - only two in. long - to stay entirely in the engine compartment. Only the tailpipe would run down the left cooling air bypass. Hoping to avoid power loss from my 2/3 length muffler, I increased its diameter to 1 1/2 in. The extra 50% diameter would increase the internal volume of my "shorty" to 140% of average commercial .60 mufflers. To further reduce power loss, I made my muffler a "flow through" or "extractor" type with a minimum tube ID of 1/2 in. The muffler was machined for me by Bob Wilder. It weighed 2 1/4 oz. installed (later reduced to 1 7/8 oz.). I was surprised at the sound suppression effected by my rather breezy contraption on the test stand and considering that it is completely housed inside the cowling of the Sea Fury, it rates as far more effective that just a "legalizer." In practice, it performed exactly as I had hoped, by effectively muffling the engine without causing any obvious power loss or increase in operating temperature. Tank is shimmed up or down by sheet balsa for engine run adjustment. This picture illustrates ease of repair and adjustment of major components and breakdown for shipping. Actual construction of the Sea Fury was at best tedious, laborious, and difficult, with its molds, jigs, mockups, and machining. I was shooting for a final weight in the low 60 oz. range and was more than a little unhappy when I realized it was going to be impossible. Where did I go wrong? Hadn't I done all the necessary molding, sanding, and constructing of built-up assemblies? Well, yes, but as I looked at the finished Sea Fury sitting in all of its pristine beauty atop my coffee table (by now my workbench was too small), it hit me. Somewhere between the initial concept and the designing of the fuselage, it had gotten away from me. Despite its short 60 in. wing, my Sea Fury was definitely not a Bearcat sized airplane. I think the day I first flew the Sea Fury was perhaps the most pleasurable day that I have ever spent in modeling. When the airplane was ready, I picked a perfect spring day for the Sea Fury's initial flights. My wife, Linda, packed a picnic lunch while I loaded the car with two large cardboard cartons of miscellaneous spare parts, tools, camera equipment, etc. We set forth tor a site in West Fort Worth, 35 miles away, where beautiful, smooth circles lay in a quiet, wooded, park-like atmosphere. After arriving, we first photographed the Sea Fury in both color and black and white (just in case). After running out the new 65 ft. .018 control lines, we pull-tested the airplane and lines, and were ready to fly. What a thrill that first flight was! The sight of a Sea Fury out there on the end of the lines was terrific! Line tension, however, was only fair and seemed to disappear during maneuvering flight. 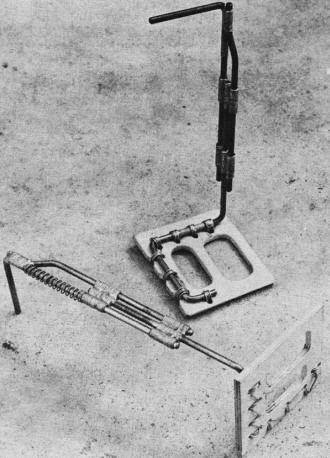 The controls were so sluggish that round loops were difficult. When the engine cut, the glide was good and the Sea Fury settled gently onto its shock absorbing gear to end a highly satisfac­tory first flight. I called to Linda for a sandwich and a Coke while I removed the wing. To correct the sluggishness of control, I changed the flap-elevator ratio from 30° flap - 30° elevator to 30° flap - 45° elevator, and added 1/2 oz. of tip weight to improve line tension. On its second flight the Sea Fury was. very responsive to control. Line tension, while improved, was still insufficient and it turned tighter inside than outside, To balance inside and outside turn rates, I removed the wing again to adjust the elevators downward slightly with neutral flap and more tip weight was added to further improve tension. On the third flight the Sea Fury turned well, both inside and outside, and the general improvement in flying characteristics permitted closer evaluation of specific areas which needed improvement. For example, it was very light on the lines overhead and now that I had time to look, the Sea Fury was flying banked into the circle both upright and inverted. So that's why I had so little line tension! The Sea Fury was my first airplane built with exactly equal span inboard and outboard wing panels and the extra lift of the faster outboard wing was causing it to fly banked into the circle. While I had anticipated a need for adjustable tip weight, I was surprised at the bank angle and a little unhappy when I saw that the tip weight box wasn't big enough. That first night I had to settle for taping extra weight onto the outside of the outboard wing tip. To adjust the tip weight, I added 1/2 oz. onto the tip each flight. With each addition of tip weight, the airplane flew flatter and line tension improved until, at three oz. total tip weight, the Sea Fury started "hinging" in the squares. With a reduction of 1/2 oz. of tip weight, the tendency to "hinge" was gone and the Sea Fury flew flat with good tension. To improve the overhead tension, I moved the leadouts forward three times, in 1/4 in. increments until no further improvement in tension was noted and the Sea Fury was beginning to feel "doggy." Moving the leadouts back one 1/4 in. increment resulted in nearly optimum leadout location. By this time it was beginning to get dark and time remained for only one final evaluation flight. This would be a full pattern flown at five feet except for the triangle and hourglass bottoms where I would pull out high and extra tight to evaluate the turning (lifting) capability. The Sea Fury flew beautifully except for a noticeable stalling tendency in the lower right triangle and hourglass corners. Well, I thought, you can't have everything, and all things considered, I was pretty proud of my 71 oz. airplane at this point. Two spectacular models of the Sea Fury. That night I thought about the stalling tendency and decided that it might be improved if I could only hang the flaps out a little farther for more lift in the corners. To accomplish this, I changed the flap-elevator ratio to 30° flap-37° elevator. 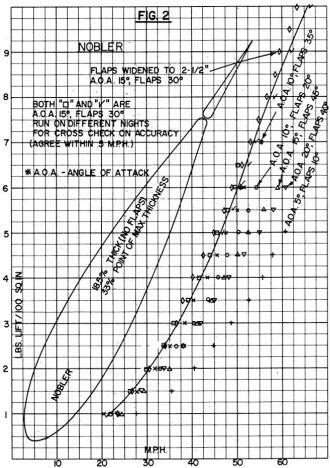 The change of ratio would definitely use more flap for any given rate of turn, but the extra flap would also reduce the effectiveness of the elevators making the airplane appear to turn sluggishly again. To compensate for the aerodynamically reduced sensitivity, I modified my small E-Z-Just handle for wider line spacing by cutting the plastic, moving the lines to the extreme top and bottom of the handle, and epoxying small pieces of plywood into the slots under the relocated lines. 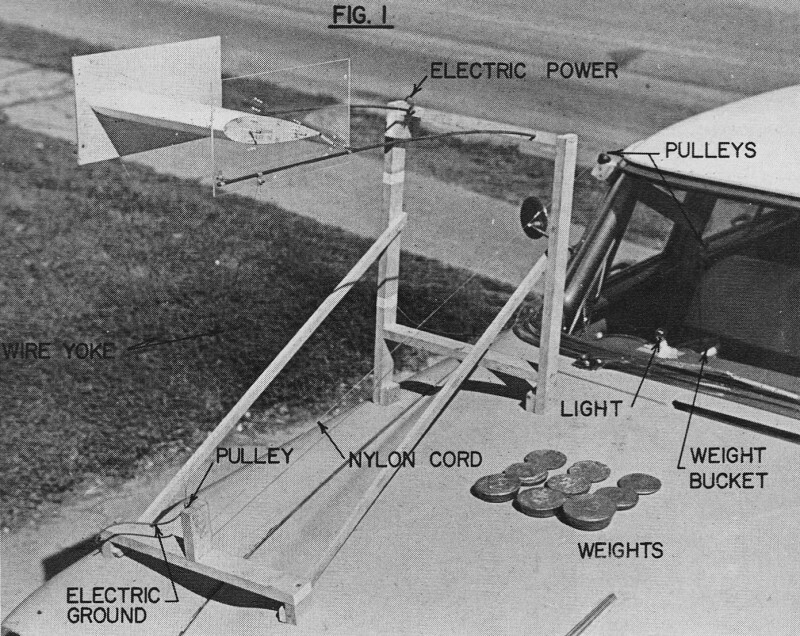 The next day's flying proved the combination of ratio change and handle modification did reduce the stalling tendency to the point that the triangle and hourglass corners could be tightened normally with no sign of buffet and no apparent change of sensitivity. To summarize the Sea Fury's flying characteristics at this point, overall I thought it flew very well and was definitely competitive. It turned as well as my Bearcat, but felt and looked much smoother due to the increased tail moment. Line tension was good except for the top of the vertical eight in wind over 12 knots. In a strong wind I would occasionally run out of elevator in the vertical eight as I started down from overhead. Also, the shock gear seemed to cause bouncy landings but that turned out to be a simple matter of improper location. Bending the gear back slightly fixed the landings completely. Finally, however exciting, the Sea Fury was difficult to fly. It could fly any maneuver competitively, but only nine out of ten times. I found that no matter how much I practiced, I would usually bounce a corner or miss a pullout or an intersection on nearly every flight. Still, if I could put it together at the Nats, the combination of smooth corners, good shapes and impressive appearance could very well win. At the '71 Nats, neither my flying or the Sea Fury's appearance seemed to make much impression on the judges in the first round of finals. I wound up "in the pack" in the mid 440s. I n the second round, the Sea Fury nosed over on takeoff after being released down­wind in a strong, gusty wind condition. All right, so an honest conventional gear is still a competitive disadvantage, even with shocks. A month later, I found this type of takeoff accident could be prevented by launching into the wind. A 73 oz. airplane seldom becomes airborne accidentally. I think most Nats stunt fliers were impressed by Gene Schaffer and his "Stunt Machine" performing in the wind. Gene's pattern seemed typical New York style except for his rather blinding corners. Chuck Hora thought Gene's corners looked as though the airplane had been "nailed," then "swiveled." While I also thought Gene's corners were unnecessarily tight, they were impressive and attention-gathering in their own right, and like beauty or semi-scale, served to attract the attention of the judges for "out of the pack" scores. I went home with the realization that the Sea Fury's corners should be further improved before Cleveland's FAI Finals to improve my chances of making the FAI team. As a matter of fact, I had two problems to overcome. First, the Sea Fury left a heavy smoke trail which distracted the judged by drifting in the rounds and being blown to the ground by the flaps in the bottoms of the squares. This caused the Sea Fury to appear to bobble when, in fact, it hadn't. Since the ST 60 would tolerate much less oil than Superfuel's 29%, I mixed my own brew: 5% nitro, 20% Ucon oil, and 75% methanol. The smoke problem was cured, but the extra 9% combustibles increased the engine run from 6:15 to 7:00 which resulted in overruns in the FAI pattern. I decreased the run by enlarging the venturi from .305 to .315 ID. Burning the extra 9% combustibles in 6:15 instead of 7:00 released extra power from the engine which "perked up" the Sea Fury's performance all around. You'd look away too if you saw the ground so close, so often. Note rivet detail; simple, clean cockpit. Second, I began retrimming. I wanted to increase the crispness of my maneuvers by tightening all of the corners somewhat. To accomplish this, I added nose weight, knowing that more stability would result from a more forward CG location. Now more control deflection would be required to maneuver. The extra flap deflection increased lift again permitting sharper corners and a trouble-free vertical eight. Admittedly, it also took more deflection of the handle too, but I soon became used to it. The extra stability from the increased nose weight also cured the Sea Fury of being difficult to fly. It no longer had a mind of its own. It drove smooth and tight to crisp, accurate corners. At last the Sea Fury had arrived as an unlimited competition stunt ship. Five flights on that snarling, pulling, groovy son of a gun would spoil for anyone, forever, the put-put of a Fox 35. On the day I was to leave for the FAI Finals, I ran out of fuel in cloverleaf on my last practice flight. Rather than accept a safe inverted landing with minimal damage, I "went for broke" again and tried to whip it through to save the airplane, undamaged, for Cleveland. It didn't work. Looking down at the mess, I knew my "go for broke" year had ended. As far as I was concerned, the Sea Fury had proven itself a competition stunt ship even though it had never won a contest. Excepting Bob McKinney, no one had seen it fly well. Rather than let it end there, I decided to rebuild the old Sea Fury and to start immediately on a new Sea Fury incorporating improvements based upon experience gained from 303 flights on the original. First, ground handling could be improved by shortening the landing gear a little to provide a flatter sitting attitude. The old gear had turned out over scale length anyway. Shortening the main gear 1/2 in. would actually improve upon scaleness. I would, of course, retain the shock absorbers as the guaranteed landings and visual effect were certainly worth the small extra weight. Second, it seemed that slightly larger stabilizer and elevators would further improve the Sea Fury's "groove." Also, the larger elevators should allow changing the flap-elevator ratio of 30° flap-37° elevator used on the Sea Fury I, to 30° flap-30° elevator, thereby wringing more lift from the wing's available area. This would permit still tighter corners. While designing the new stabilizer, it seemed a good idea to incorporate some "direct lift." "Direct lift" is simply rendering the elevators aerodynamically ineffective or insensitive around neutral. With "direct lift," small control handle inputs have little or no effect at the elevators but the accompanying small movements of the flaps cause the airplane to rise or descend smoothly, without any change of pitch attitude. By making most small flight path adjustments with the flaps only, the apparent smoothness of the flight is greatly improved. There are several easy methods of obtaining "direct lift." The first, and most common, is simply to drill out the elevator pushrod bushing in the elevator horn to put "slop" in the elevators. Most fliers who use "slop" can move their elevators up or down about 3/16 in. at the trailing edge without moving the flaps, or, more properly, can move the flaps without moving the elevators. 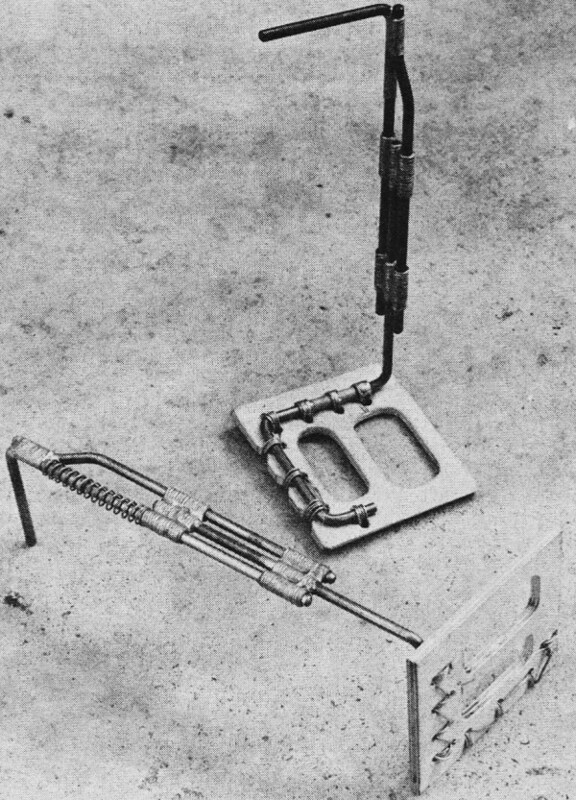 Another method used by World Champion Bill Werwage on his "Pacemaker" is to make the stab thicker than the elevators. 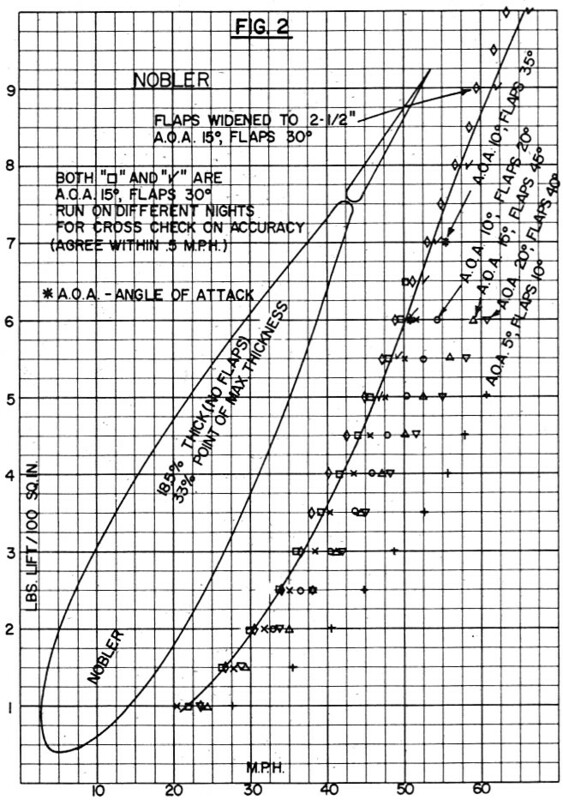 Also, at one time or another, RC fliers Phil Kraft, Jim Kirkland and Art Schroeder have related their experi­ences with stab types and generally agree that an airfoiled stab arrangement will have less elevator sensitivity around neutral than a flat stab setup. Since I practice 800 to 1000 flights each year, I already have problems enough with wear, so I decided to avoid "slop" and combine Bill's thick stab with as much airfoil as my construction method permits to obtain "direct lift" characteristics for the Sea Fury II. Third, just in case the ratio change for increased lift was not quite enough by itself to obtain really outstanding corners, I would add one in. of span to each wing panel for a 4% increase in wing area. Finally, I would try again to reduce weight, particularly in the tail. Because of the Sea Fury's unusual moments, a fraction of an oz. saved in the tail would be greatly magnified in the reduction of nose weight required. 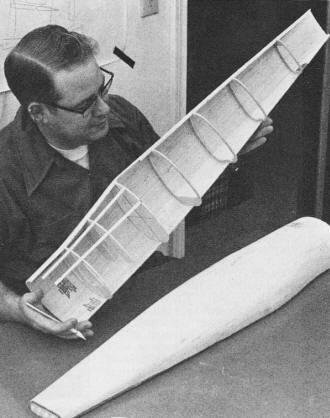 For example, the wing fillets were already molded from 1/16 in. sheet balsa but the Epoxolite fillets at the fin, stab arid. 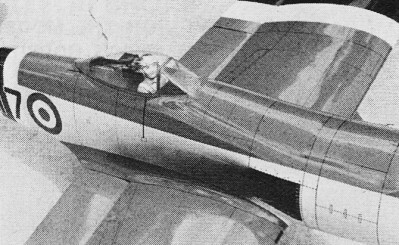 fuselage junction could be replaced with 1/32 in. balsa sheet fillets. A plastic hub Williams tail-wheel would replace the metal hub Perfect. Additional weight savings could be realized by skeletonizing the main gear platforms and spar webs. In addition to the normal hollowing of the wing tips and cowl ring, the rudder and elevator spars were hollowed as were the specially cut wing trailing edge pieces. I'm sure you get the idea. In fact the Sea Fury II did weigh nearly two oz. less than the Sea Fury I. I had hoped for a greater savings. It looks like the larger wing and stab offset most of my additional effort. The new Sea Fury and repairs to the old were were begun simultaneously. The Sea Fury I needed a completely new forward fuselage assembly beginning just ahead of the cockpit. Molding the new fuselage half-shells fitted nicely with the molding of the new "II" fuselage shells and much time was saved by constructing duplicate bulkheads, firewalls, tank compartments, cooling air bypasses, cowl rings, etc. By the time the Sea Fury I's structure was repaired, the basic fuselage for the Sea Fury II was complete. I'm certainly glad that I repaired the broken Sea Fury because work progressed slowly on Sea Fury II due mainly, I guess, to watching too much TV in my workshop. By the time I finished Sea Fury II on July 4th, I had been able to put in nearly 300 practice flights and two contest wins on the repaired Sea Fury I. Also, the repaired Sea Fury was used to break in several new and overhauled engines and at least 100 flights were made using Sea Fury II's tank, engine mounts, and muffler before Sea Fury II was finished. The first flights on the new Sea Fury II eliminated any doubts about the value of my modifications for improved performance. 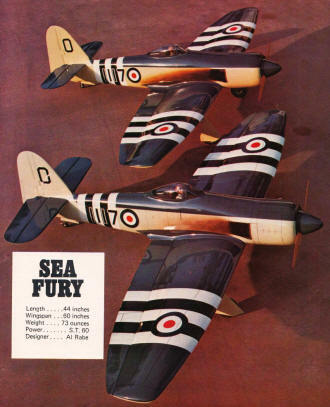 The most noticeable difference was the Sea Fury II's ability to turn in the lower right triangle and hourglass comers. With the Sea Fury II there is no buffeting in those corners no matter how hard you tilt them. Corner radius everywhere is now limited only by reaction time, smoothness and practice. The new Sea Fury II is so much improved over the Sea Fury I that my next building project is larger stab and elevators for the old Sea Fury to improve its "groove" and permit the ratio change for more lift. 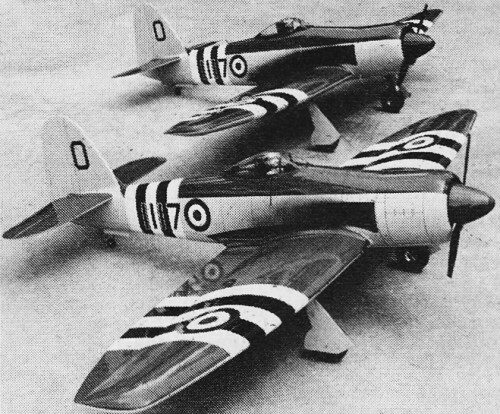 If this doesn't produce approximately identical performance to the Sea Fury II, I'll build a new wing with the extra two-in. span. The Sea Furys will then be structurally identically. A rework of the cockpit and anew paint job will complete the transformation. My final change to improve the overall appearance of the Sea Fury's pattern was to increase the control-line length from 65 ft. to 70 ft. People have remarked before that a large airplane like the Sea Fury tends to look cramped for space while maneuvering on my old lines. With the new, longer lines this cramped appearance was completely eliminated. Now people complain about the size of my maneuvers. Anyway, the net effect was definitely beneficial so the Sea Fury II was trimmed to fly best on the longer lines. I did notice one curious effect of flying on longer lines. To maintain the necessary five sec. lap time for a 6:30 pattern, I had to lean the engine slightly. The leaner mixture brought unexpected fuel economy and my engine run went up to 8:00. Further enlarging the venturi led to instability of my run, so instead, I shortened the duration to 6:30 by increasing the nitro content of my fuel to 10%. By working a less desirable schedule and losing a lot of sleep to early morning practice, I was able to get 150 flights on the Sea Fury II before leaving for the 1972 Nats in Chicago and another 45 flights in Chicago before Open finals. With a good airplane and a luck draw in flying order, my Sea Fury and I were able to pull off a win in Open Stunt. This was particularly satisfying as a few short years ago separate Stunt events were sometimes held for semi-scale stunt ships because of their supposed inability to compete effectively with "classic" stunt ships, This year, realistic semi-scale stunt ships took first, third and fourth in Open Stunt and first in Senior Stunt. Maybe now I've heard the last of those cracks about semi-stunt scale ships. Let me end with a precaution. 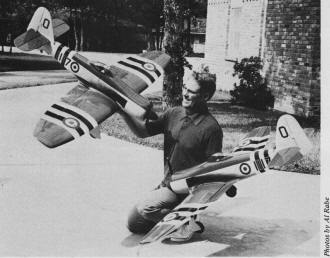 It has been demonstrated that realistic semi-scale airplanes can compete effectively with classic stunters, but - they are heavily compromised. With less than optimum moments, shapes and wing locations, and with a significant tendency to build overweight because of greater bulk and larger surface areas to paint, you start out with two strikes against you in competition. Add to the a requirement for up to three times greater construction time, and it becomes obvious that realistic semi-scale projects should not be lightly undertaken. To design a realistic semi-scale stunt ship you must somehow overcome its disadvantages in layout and bulk. To do this you will surely need to use unique construction techniques, extra built-in trimming capability, up-to-date aerodynamics and clever or creative ideas and concepts. If you are clever or lucky enough to come up with a truly competitive design, you still have to practice as much as the other top fliers to develop the necessary flying skills to win. In other words, think about it.